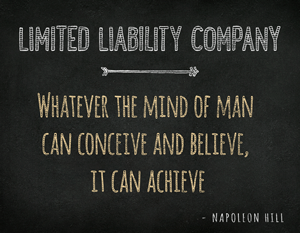 What is an Illinois Limited Liability Company? Our Chicago business attorneys form limited liability companies (LLC) in Illinois more than any other business entity. A limited liability company is a noncorporate Illinois business entity formed pursuant to the Illinois limited liability company statute that, if properly organized, provides business owners protection against unlimited personal liability from creditors and third parties. While other business entities provide certain protection from creditors and third parties, an LLC also retains the important characteristics of being a “pass-through” business entity for federal and state income tax purposes (e.g., sole proprietorship, partnership and S-Corp tax elections). The LLC’s option to elect pass-through tax treatment is very attractive for small businesses and startup’s. The pass through tax structure allows taxable revenues, expenses, gains, and losses to be passed through to the business owners personally. However, it should be noted that a limited liability company may also elect not to be a pass through entity for income tax purposes and thus may be taxed as a C-Corporation. An LLC offers exceptional flexibility to conduct is operations and internal affairs in a manner most advantageous for its business owners. The Illinois LLC statute allows for an LLC and its members to adopt an operating agreement, specifically tailored to address the internal affairs and operations of the business, which will set forth how the LLC is to be organized, managed, controlled, financially structured (i.e., capital contributions, sharing of profits and losses, distributions, allocations, additional capital requirements, etc), merged, acquired, dissolved and liquidated. Additionally, with some restrictions, generally any individual, corporation, partnership (general or limited), trust, or other LLC may be a member of an LLC. Generally, the Illinois LLC statute is liberally construed so as to provide maximum effect to the freedom of contract and the enforceability of the LLC’s operating agreement (which is similar to the bylaws, shareholder agreement of a corporation, or a partnership agreement for a partnership). With the recent popularity of Illinois limited liability companies, business owners forming new businesses in Illinois often seek clarification between the similarities and differences between single member LLC’s and sole proprietorships. Specifically, single member LLC’s and sole proprietorships are owned, operated, and controlled by a single individual and are treated as flow-through entities by default (unless the single member LLC elects to be treated as an S-Corp or C-Corp) for federal tax purposes. The first significant difference between a sole proprietorship and a limited liability company is the business entity is formed. A sole proprietorship does not require any specific legal documents, Secretary of State business filings, or formal procedure to be created. An LLC can only be formed by registering the LLC with the Secretary of State and establishing the appropriate legal documents, such as the operating agreement. The second significant different between a sole proprietorship and a limited liability company is the business owner’s personal liability for the company’s debts and obligations. In a sole proprietorship, the business owner is personally liable for the company’s debts and obligations. In an LLC, the member (or business owner) is not personally liable for the LLC’s debts and obligations unless the business owner specifically agrees to be liable for (or guarantee) the LLC’s debts and obligations of the Illinois statute provides for liability by the business owner, such as authorizing distributions that would result in the LLC not being able to pay its debts and obligations. Our Chicago business attorneys form limited liability companies (LLC) in Illinois more than any other business entity. An LLC offers exceptional flexibility to conduct is operations and internal affairs in a manner most advantageous for its business owners. For more information of forming an LLC in Illinois for your Chicago business, please do not hesitate to contact our Chicago law firm. Limited liability companies have similar characteristics to that of an Illinois partnership and have often been compared to general partnerships due to the flexibility it may have in its operational structure. Specifically, both the LLC and partnership are contractual in nature. In other words, the LLC and partnership operate pursuant to the agreement (partnership agreement for a partnership or operating agreement for an LLC) executed between the business owners and the business entity. Although both LLC’s and partnership operate and function pursuant to an agreement (as noted above), they are different in the way they are formed and terminated, and the responsibility the owners have with respect to the company’s liabilities. LLC’s and partnerships may also be different in the way they are operated and treated for federal and state income tax purposes. For example, a partnership may only elect a partnership tax treatment, as opposed to an LLC which may elect to be treated for tax purposes as a sole proprietorship, partnership, S-Corp or C-Corp. The first significant different between LLC’s and partnerships is how the businesses are formed. A general partnership, like a sole proprietorship, does not require any formal legal agreement or business registration with the Illinois Secretary of State to be created. An LLC can only be formed by registering the LLC with the Secretary of State and establishing the appropriate legal documents, such as the operating agreement. The second significant different between an LLC and a partnership is the business owner’s personal liability for the company’s debts and obligations. In a partnership, all partners are jointly and severally liable for partnership debts and obligations. Also, all partners have the duty to provide full disclosure and duty to act as a fiduciary to the other partners. Generally, a partnership is operated and managed equally by its partners. In an LLC, the business owners, or members, may elect an operating structure that is not equal among the members and management may be allocated to certain members while other members may remain passive. Illinois Limited liability companies have similar characteristics to that of a Illinois corporation, especially Illinois close corporations with less than 50 shareholders, that restrict the transfer of stock, and lack corporate formalities such as a board of directors, corporate bylaws, etc. Corporations and LLC’s may be operated and managed in an identical manner. Corporations generally have a centralized management structure in the form of a board of directors and corporate offices. LLC’s may choose to be operated and managed by a centralized management structure like a corporation. Conversely, corporations may be managed and operated directly by the business owners by electing to be a close corporation. LLC’s may also elect to be operated and managed directly by the business owners. The most significant similarity, however, is that corporations and LLC’s offer business owners limited liability if the business is properly structured. Both business entities provide protection from personal liability to the business owners against third parties for corporate or LLC debts and obligations. The most significant difference the LLC possesses is its flexible business structure, especially with respect to its management and control of the LLC, and greater flexibility in its capital structure, distributions, transfer of ownership interests, tax, and termination procedures. The limited liability company operating agreement is the principal governing document of an LLC. Although the filing of the articles of organization with the Illinois Secretary of State legally creates an LLC, the articles of organization generally do not contain the critical provisions of how the business will be operated. The agreement of the business owners (and managers, offices of the LLC, if any) relating to the internal governance of the LLC, along with the agreement among the business owners regarding the business relationship, is provisioned in the operating agreement. The operating agreement is a private agreement of the company and is not filed with the Illinois Secretary of State. All members of a limited liability company may enter into an operating agreement to regulate the affairs of the company and the conduct of its business and to govern relations among the members, managers, and company. To the extent the operating agreement does not otherwise provide, this Act governs relations among the members, managers, and company. Except as provided in subsection (b) of this Section, an operating agreement may modify any provision or provisions of this Act governing relations among the members, managers, and company. eliminate or reduce the obligation of good faith and fair dealing under subsection (d) of Section 15-3, but the operating agreement may determine the standards by which the performance of the obligation is to be measured, if the standards are not manifestly unreasonable. Our Chicago attorneys have significant experience in handling a limited liability organizations and reorganizations in a diverse number of business industries. To schedule a consultation with one of our corporate lawyers today, please contact us online or give us a call at 312-789-5676.